Thai Airways International Public Company Limited (THAI) celebrated 30 year of flights to Nagoya, Japan with a reception based on the theme “the World is Always New with THAI,” which was presided over by Mr. Ekniti Nitithanprapas, THAI Chairman of the Board of Directors and attended by Mr. Sumeth Damrongchaitham, THAI President, Mrs. Usanee Sangsingkeo, THAI Senior Advisor, and Mr. Wiwat Piyawiroj, THAI Executive Vice President, Commercial. THAI Management and THAI General Managers in Japan welcomed Mr. Bansarn Bunnag, Ambassador of the Kingdom of Thailand to Japan, Mr. Kimio Ishihara, Deputy Governor of Aichi Prefecture, Mr. Takashi Kawamura, Mayor of Nagoya, Mr. Akihiko Naoe, Deputy Chairman of the Japan Association of Travel Agents (JATA), guests of honor, and members of the press who attended the reception in Nagoya, Japan. 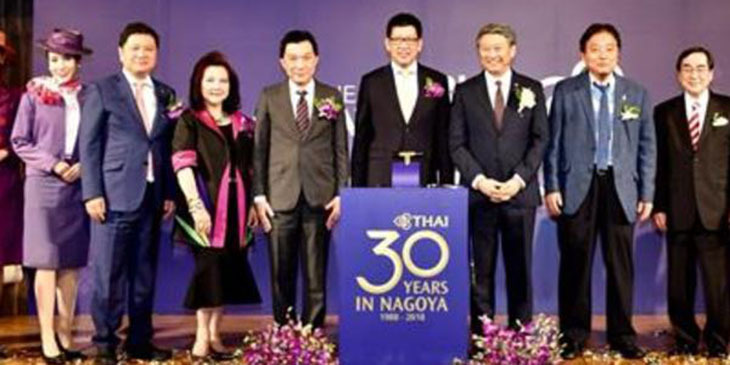 Mr. Wiwat Piyawiroj, THAI Executive Vice President, Commercial, said that THAI has operated flights to Nagoya for 30 years since 31 October 1988 as a code-share flight with Japan Airlines, which began with two flights per week and utilized Airbus A300-600 aircraft. Nagoya is the third largest city in Japan and is a highly popular destination in Japan, in addition to Tokyo, Osaka, and Fukuoka. Flights from Bangkok to Nagoya, other than providing convenient travel to and from Thailand-Japan, signify good bilateral relations between the two countries. Over the years, air travel from the Southeast Asia and Pacific regions to Japan grew significantly and rapidly, as Japan is rich in art and culture and has remarkable nature tourism to be discovered. In addition to its tourist attractions, Japan is a highly popular for business travel. Thailand has always been very popular for its tourist destinations and has the geographical advantage as a stopping ground for passengers who are connecting flights to other regions. Currently, THAI operates 77 flights per week to 5 cities or 6 airports, which are Tokyo (Narita/ Haneda), Osaka, Nagoya, Fukuoka, and Sapporo. Passengers can also connect flights to 57 destinations in 31 countries worldwide on THAI’s network. Over the past 30 years that THAI has operated flights to and from Nagoya, passenger traffic has increased substantially and on a regular basis. Presently, THAI operates 14 roundtrip flights per week from Bangkok-Nagoya with Boeing 787-8 and Boeing 777-300ER aircraft. THAI operates all flights with touches of Thai culture and tradition, an excellence that has received recognition with three Skytrax Awards: World’s Best Economy Class, World’s Best Airline Lounge Spa, and Best Economy Class Onboard Catering.